Citroen C1 1.4 HDi B0 cambelt change instructionts . Full guide! 12,500 mile service intervals – replacement every 150,000 miles or 10 years under normal conditions or 120,000 miles or 10 years under adverse conditions. 20,000 mile service intervals – replacement every 160,000 miles or 10 years under normal conditions or 112,500 miles or 10 years under adverse conditions. The previous use and service history of the vehicle must always be taken into account. CAUTION: This engine has been identified as an INTERFERENCE engine in which the possibility of valve-to-piston damage in the event of a timing belt failure is MOST LIKELY to occur. A compression check of all cylinders should be performed before removing the cylinder head. Auxiliary drive belt tensioner tool – Citroen No.(-).0194.E/E3. Auxiliary drive belt tensioner locking tool – Citroen No.(-).0194.F. Camshaft sprocket locking tool – Citroen No.(-).0194.B. Crankshaft/high-pressure fuel pump sprocket aligning tool – Citroen No.(-).0194.A. Exhaust pipe clamp removal tool – Citroen No.C.193-A. Flywheel locking tool – Citroen No.(-).0194.C. C3 III: Set of blanking plugs – Citroen No.(-).0194-T. DO NOT turn crankshaft or camshaft when timing belt removed. Remove glow plugs to ease turning engine. Turn engine in normal direction of rotation (unless otherwise stated). DO NOT turn engine via camshaft or other sprockets. Raise and support front of vehicle. C1/C3 III: Auxiliary drive belt. Use tool Nos.(-).0194.E3/F. C2/C3 I/II/Pluriel: Auxiliary drive belt. Use tool No.(-).0194.E. C1: Remove screws retaining coolant expansion tank. Move coolant expansion tank to one side. C3 III: Disconnect and seal off fuel pipes. Use tool No.(-).0194-T. Disconnect wiring harness from timing belt upper cover. Timing belt upper cover  . Exhaust downpipe. C1: Use tool No.C.193-A. Blanking plug from bell housing. Turn crankshaft until flywheel locking tool can be inserted. Fit flywheel locking tool. Tool No.(-).0194.C  . Timing belt lower cover  . Remove RH engine mounting and bracket. Fit crankshaft pulley bolt  . Turn crankshaft slowly clockwise until camshaft sprocket timing hole aligned  . Fit camshaft sprocket locking tool. Tool No.(-).0194.B  . Insert crankshaft aligning tool. Tool No.(-).0194.A  . Insert high-pressure fuel pump sprocket aligning tool  . Tool No.(-).0194.A. Slacken tensioner pulley bolt  . 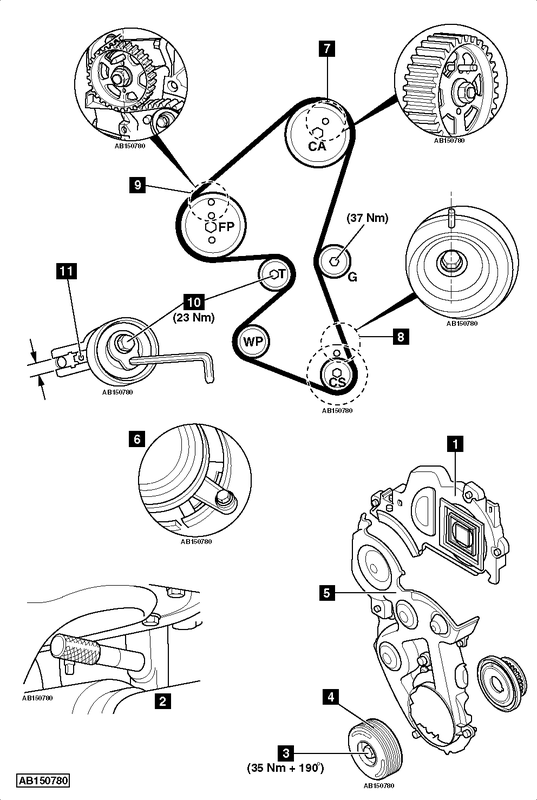 Remove timing belt.NOTE: Ensure crankshaft position (CKP) sensor reluctor is not damaged. Check tensioner pulley, guide pulley and water pump sprocket for smooth operation. Ensure camshaft sprocket locking tool located correctly  . Ensure high-pressure fuel pump sprocket aligning tool located correctly  . Ensure crankshaft aligning tool located correctly  . Turn tensioner pulley anti-clockwise until pointer aligned in window  . Use Allen key. Tighten tensioner pulley bolt to 23 Nm  . Camshaft sprocket locking tool  . High-pressure fuel pump sprocket aligning tool  . C1/C2/C3 I/II/C3 Pluriel: Turn crankshaft slowly ten turns clockwise. C3 III: Turn crankshaft slowly six turns clockwise.NOTE: Ensure crankshaft sprocket remains in position. If tools cannot be inserted: Repeat installation procedure. Ensure tensioner pulley pointer aligned in window  . If not: Repeat installation procedure. Fit flywheel locking tool  . Remove crankshaft pulley bolt  . Tighten crankshaft pulley bolt  . Tightening torque: 35 Nm + 190°. Remove flywheel locking tool  . Install components in reverse order of removal.